this week i got my hours cut back at work. con: we’re buying a house. this makes renovations on bathroom/kitchen/laundry room and buying the much needed washer/dryer/range/furniture a little bit more difficult. pro: i have a three day weekend with my husband. every weekend. i love that he works four 10 hour days, but it was always a little hard to get out of bed and be at work while he was fishing, gardening, and doing whatever he did by himself on a friday. forced three day weekend to spend time with my husband? i’ll take it. another pro: time to do things that i’ve wanted to do, but just didn’t feel like i had the time. taking more photos. working and playing outside a little more. and starting a blog with my husband. we’re geeky and kind of excited to share the things we think are fun. 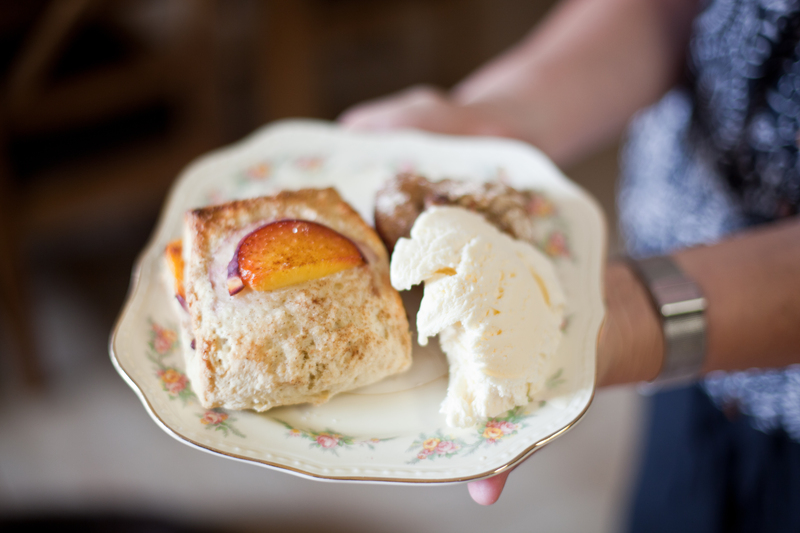 one of my favorite peach recipes from joy the baker was discovered last summer. after my father passed away, my mom and i used to make this for breakfast. with ice cream. and we reminisced about how much he loved sweets. peaches at the store were amazing yesterday, so we naturally had to make these. and we couldn’t just stop at one peach recipe. nathan and i love to make scones. when i saw this recipe, i couldn’t wait for peach season to hit wisconsin. today was the day. these were one of my favorite scones. they aren’t too sweet, and are deliciously buttery. joy the baker didn’t disappoint again! In a mixing bowl, sift together flour, sugar, baking powder, baking soda and salt. Cut in shortening and butter until mixture resembles coarse meal. In another bowl, combine egg, milk, and vanilla, and beat lightly with a fork. Add the liquid to flour mixture all at once, stirring enough to make a soft dough. Turn out onto a floured board and knead about 15 times. If the butter has warmed too much in the making of the dough, shape the batter into a dish, wrap in plastic wrap, and let rest in the fridge for 15 minutes. If the butter is still cool, shape the dough into a disk and, on a well floured surface, roll dough to a little less than 1/2-inch thickness. Our dough was about 12-inches long and 8-inches tall. Brush half of the rolled out dough with buttermilk. Arrange peach slices, in a single layer, across the buttermilk moistened dough. Sprinkle with half of the cinnamon sugar mixture. Carefully fold the empty side of dough over the peach sliced layer. Press gently together. Add a bit of flour to your hands and press the edges of the dough in, creating more of a rectangle shape than a half circle shape. Using a floured knife, slice dough into eight (or six…) pieces. Place dough on prepared baking sheets. If dough has warmed, and feels mushy, place in the fridge for 20 minutes to rechill. Remove from the fridge. 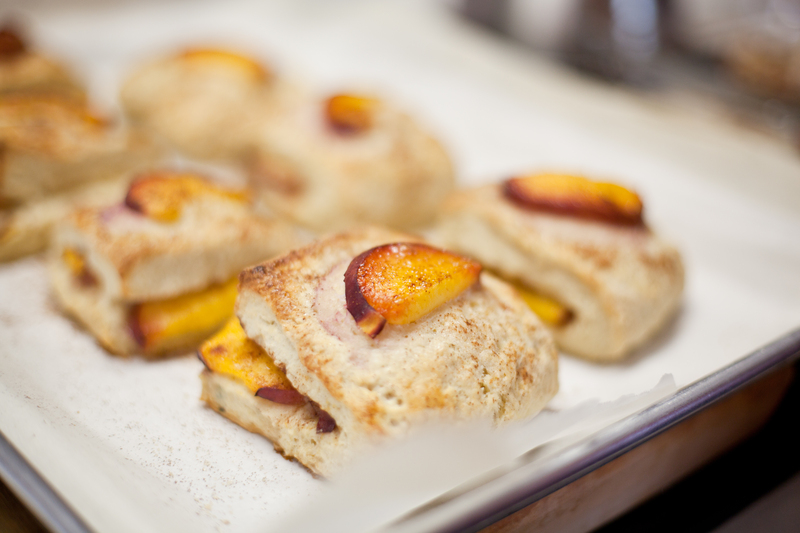 Brush each scone top with buttermilk, a slice of peach, and sprinkle with remaining cinnamon sugar. Bake scones for 15-18 minutes, until golden brown and cooked through. Remove from oven and allow to cool for 15 minutes before serving. ← well hello, blogging world! it’s nice to meet you. well fancy that – peach season just hit it’s peak in mpls, too! these have been on my list all week to make this weekend. sorry about your hours, but i know the hours spent together will be so much better spent :o) God will provide for the other necessities in only the way He can. and what a sweet story that will make for! i’m excited too! love you, friend, and hope to see you soon! Save a few peaches for this easy salad. It’s delish!